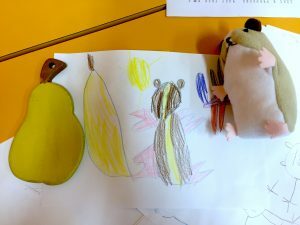 Children of Urša Domžale preschool learnt how to take care of their own garden, how to cook traditional meals and prepare drinks from their herbs. They managed to reduce waste and create their own menu. You could taste homemade spinach or hazelnut spread or many other spreads made from organic ingredients. You could drink herbal tea from a garden. And you could discover diverse types of plants and try to plant them on your own. 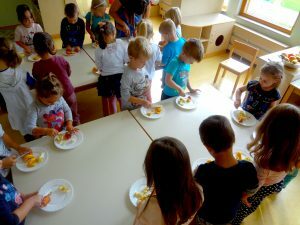 „Kuhna na plac!“ or „Kitchen in the marketplace!“ was the name of this event organized by children and their teachers to present the „We Eat Responsibly“ project at Urša Domžale preschool. Children were also distributing recipes of traditional dishes that they collected. Moreover, they also informed others about recycling, for example old clothes from which their aprons were made from. How to make a real impact? 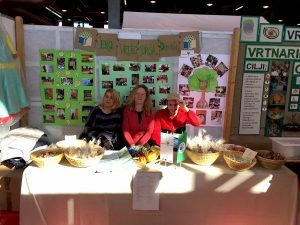 In Urša Domžale the set goal was to reduce food waste both at school and at home. The action plan to understand connectivity of the global and local dimensions of food production through various activities was established. Throughout the year children explored the origin of various types of plants and traditional recipes of their region, visited local food producers and suppliers to understand the origin of their meals. Children, alongside teachers, were also preparing meals and drinks for weekly cook-together events. During these events, they were using their own produce from the school vegetable and herb garden. Kids were so creative that they even created their own authentic menu. They also measured food waste during the entire year and at the end, they could proudly say that food waste was reduced to a great extent! Their supervisor was Mr. Hamster, a toy. Children often informed him about their remarkable success. Not only Mr. Hamster was proud of these smart kids, but also their teachers, parents and many others.